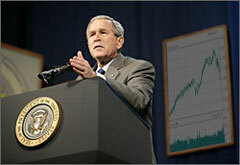 In a moving appeal delivered during the annual Christmas dinner of the American Association of Wealthy Persons, the president requested lawmakers enact legislation that would immediately address the sharp decline in investment banker bonuses that has resulted from the turmoil in international financial markets during the latter half of this year. "The subprime lending crisis has affected each and every one of us," the president said. "It hurt some people who lost their homes. It hurt some more people who can't buy a house now that credit's all dried up. But most of all, it hurt those good people who got salaries depending on the free flow of financial liquidity and on being able to package and sell high-risk subprime loans as AAA-grade mortgage-backed securities. I'm talking about investment bankers, hedge-fund managers, mergers and acquisitions specialists, traders. Those are the hard-working people we need Congress to help out now, and I'm hoping they'll do what's right." 2007 saw an average drop of between 10 and 20% in the bonuses awarded to securities analysts, investment bankers, hedge-fund investment managers and other traders and bankers, reducing, in many cases, their compensation to near-2005 levels. The continuing aftermath of the subprime lending crisis has been singled out as the primary cause of the drop. "I've talked to some of these people, a lot of these people, friends of mine," president Bush said, "and they're feeling the hurt. My friend Lloyd Blankfein at Goldman Sachs, guess how much he got in bonus last year? $50 million. Now guess how much he's getting this year? $45 million. That's a 10 percent drop, a pretty big hole in anybody's wallet. And I want our Congress to do something about it. I know people had to give up on buying a second jet, more comfortable jet, give up on the mile high hot tub. That's no good for a economy." The top 25 hedge-fund investment managers, whose annual compensation averaged $570 million in 2006, may see an average decline to $500 million or less in 2007, according to Inspirational Investor's Beta magazine. The top two or three traders may see drops in annual salary to below the $1 billion mark. "And what about the illegals, illegal worker, undocumented migrants who got a economy also depends on those people?" president Bush said. "Your salary goes down from $25 million to $22 million, maybe you got to give up one or two of the Mexican gardeners, or a Jamaican nanny, cook, cleaner, pool guy, lawn guy, limo guy. What happens to those guys? They turn into burdens on the taxpayers, and that's bad for growth." In his speech, president Bush requested Congress construct a bonus bailout package that would alleviate the subprime mortgage strain on banker bonuses by providing a "2006 plus 10" federally-funded equivalency guarantee. The 2006 plus 10 legislation would, according to president Bush's request, "fill in the gap between what people, investment bankers got paid in 2006 and what they got paid in 2007, with a annual increase of 10 percent like usual." While no official figures have yet been released, budget analysts estimate the investment banker bonus bailout would cost taxpayers roughly $182 billion in fiscal year 2008. "Once we help these people get through their hard times," president Bush said, "I expect Congress going to start talking about doing something about those subprime people, those people had the subprime mortgages who got no homes, no place to live now, if there's any money left over. I guess that's up to them, but anything makes the deficit get bigger isn't going to be a priority of me as the president, and I'll be ready to veto any legislation lands on my desk that does that. Their choice." The response of AAWP dinner attendees to the president's speech was "uniformly positive," according to a guest.